Yoga teacher Amy Devi leads regular donation classes at Yoga Pod LoDo, one of our founding 108 Partner Studios, to support our shared mission of bringing yoga to the underserved. She also inspires her students to explore the joy of service themselves by teaching our “How Can I Serve?” training module as part of Yoga Pod’s Seva Teacher Training. For Amy, giving back is part of her daily life. We asked her to tell us what inspires her service, and how it’s shaped her personal and professional life. For a long time, the idea of giving back and serving made me feel guilty, and like I had to pay for the privileges I’ve had during my life. Magically, connecting to myself with a committed yoga practice, I realized service was not about ME and instead was about WE. When it hit me that service is about connection and being with others, I realized how much I actually enjoy giving back. Whether I’m serving someone who had the courage to show up at the Yoga studio for the first time, or I’m serving my neighbors by bringing in their trash can, service has become a way of being for me. My mantra when I’m working with my coaching and consulting clients is “Who/how can I serve?” AND sometimes service means letting someone do something nice for you. 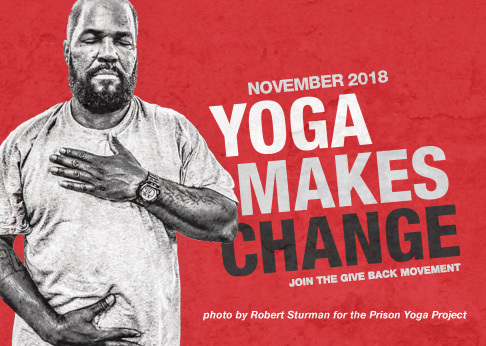 The more I get to know Give Back Yoga and their team, the more inspired and connected I feel. I have had the honor of teaching two public donation classes for Give Back Yoga, and am always awed by the community who shows up at these events. I make sure all of my amazon.com purchases are made through smile.amazon.com, and that a percentage goes to the Give Back Yoga Foundation. I get to teach the How Can I Serve? module at Yoga Pod Yoga Teacher Trainings. My favorite part about it is watching the eyes of the new teachers light up when they too realize service isn’t about fixing things or guilt…it’s incredible how many ideas we come up with for how to serve. Actually most of us, in our dharma, in our natural most aligned state, are here to serve one another in one capacity or another. Whether it’s teaching free classes at a women’s safe house, or making delicious lattes, we all thrive when we serve one another.